As I mentioned in my last post, I recently returned from a Photography With Heart workshop in Zion National Park. Scanning through some of my favorite images from the park, I noticed something interesting. Though the presence or 'feel' of the park was in them all, when I broke the images down to their basic components they consisted , for the most part, of things that I could find right here in Western Pennsylvania where I live. Consider this image entitled "Backlit Cottonwoods". 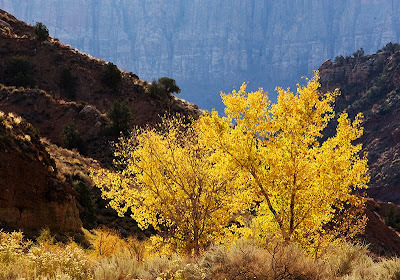 At its most basic, it is 'simply' an image of colorfall backlit trees with fall foliage. I was drawn to the scene not only because of the intense color of the backlit trees, but also because I enjoyed composing it with the diagonal lines of the mountains on either side of the trees along with the hazy, distant canyon wall in the background. I felt that the diagonals added something special to the image and that the canyon wall in the background, together with the classic cottonwoods, gives the photograph a decidedly 'Zion' feel. When I go on a workshop I go with a mind that is hopefully open and 'ready' to try to be creative. I think it is quite natural to have that feeling when going away on a trip. But when I think about it, the basic components of the "Backlit Cottonwoods" image are all around me, even now that I am back home. There are plenty of trees with fall foliage here, and one only has to go at the proper time to find them backlit. True, I may not have a canyon wall available to put in the background, but is that really the essence of the image? Wouldn't the image also work well with the terrain that I have available here at home used to frame the trees or provide leading lines? I think it would! One of the things that I hope I have accomplished at the workshop is to learn to discard the state of mind that says you have to go 'someplace special' to make special images. Sure it is fun to go away, and a change of scene always spurs creativity, but that should only serve as a stimulus to return home and harness that creativity to make images where you spend most of your time living. One of the things that I hope that I have brought home with me from the workshop is an enhanced ability to be open to 'seeing' what surrounds me the 99% of the time that I am home. If one can do that, I think the odds of making meaningful images increases quite dramatically!